Caravan Immigrant: "We Would Have Stayed in Paradise in Honduras, but the Soros Money was Just Too Good"
Tijuana, B.C., Mexico - Several migrants interviewed near the international border crossing in Tijuana expressed regret that they had left their comfortable lives, residing in beautiful homes in crime-free resort settings in Honduras and Guatamala, and plentiful high paying jobs provided by kind-hearted local authorities, to trek across Mexico and attempt to cross the border into the United States. They only left this paradise after being paid huge sums of money by U.S. financier and supporter of liberal causes, George Soros, to make the journey. "We called him Mr. George, he would always come around and try and convince us to leave, he said he needed more voters for his Democratic Party in America. We kept saying no, but finally he offered us so much money we just had to walk thousands of miles across Mexico, some of us barefoot and holding children. 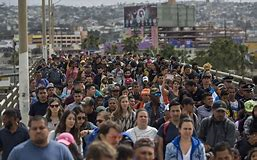 I hope we can get it and start voting Democrat very soon", said one immigrant at the border fence.